The inspection camera opens a new view into the insides of machines and systems; whether an endoscope, thermal imaging camera or infrared thermometer - an inspection camera is the ideal instrument for monitoring and maintenance. Due to the flexible control of the endoscope or the visual display of potential damage areas in machines or systems, weaknesses and points of failure can be detected and therefore be prevented. The inspection camera make this possible without the need for complex disassembly. The inspection camera is used by electricians, safety experts, expert witnesses, mechatronics, and mechanics. 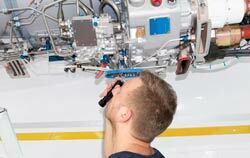 The inspection camera is also used for apprenticeships and in-service training. An inspection camera can be applied internally as well as at school or at universities for demonstration purposes. With their help, inspections in the industrial sector can be organised considerably faster, more targeted and more cost-efficient. An inspection camera is an important companion in the course of everyday work. An articulating inspection camera offers lots of benefits. Very often in industrial applications only small entrances are usable to bring the inspection camera tip (in case of borescope) into the inner parts of machines, but when it is inside there is much more space / cavity. There the articulating function is of great value. Internal part inspections can be done in an easy way by using the 360 ° articulating inspection camera tip. PCE Instruments offers rigid, semi-rigid and flexible inspection camera endoscopic cables. Among the flexible models of inspection camera cables, you will find 2-way and 4-way articulating cables that allow camera heads to be moved in different directions and angles up to 360°. 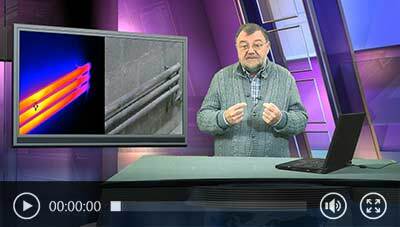 Here you can see videos of Wolfgang Rudolph on the theme inspection camera. If you have any questions, please contact us at or Phone: +44 (0) 2380 987 035 for PCE Instruments UK or or Phone: +1 (561) 320-9162 for PCE Americas Inc.
PCE-VE 180 is a rechargeable handheld pistol-grip borescope inspection camera with video recording and image capture functionality. Equipped with built-in LED lighting on the waterproof camera tip, the PCE-VE 180 inspection camera features a detachable remote control with integrated 3.5" LCD for easy viewing and navigation. The remote control communicates using radio transmission at 2.4 GHz. PCE-IVE 320 is a borescope, inspection camera, videoscope or industrial endoscope that comes with a rigid telescoping pole that extends up to 2.3 m (7.6 ft) in length (3 m / 9.8 ft long total with camera connection). Plus, the borescope has a 0.3 megapixel camera with a 23 mm (0.91 in) diameter flexible head with microphone and 12 white LEDs offering adjustable brightness. Includes wheel attachment for under vehicle inspection. PCE-VE 390N is the ideal inspection camera snake for the analysis of buildings (walls, supports, eaves, gutters, attics, crawl spaces), plumbing (pipes, drains, sewers, wells) and heating, ventilation, air conditioning and refrigeration (HVACR) systems (ducts, furnaces, chimneys, boiler and condenser tubes). The IP68-rated cable of this inspection camera is waterproof and heavy duty, making the PCE-VE 390N well suited for use in tough environments like construction sites and industrial installations. PCE-VE 350N is a two-way articulating inspection camera, borescope, videoscope or industrial endoscope for the non-destructive inspection (NDI) of hard-to-reach places. The waterproof camera head features 4 LED lights with automatic illumination. In addition, digital image magnification or zoom of up to 2 times is available. PCE-VE 380N is a waterproof inspection camera, videoscope, endoscope or borescope with a handheld monitor that allows you to gain valuable visual insight into the inner workings of machines and other small spaces such as ventilation ducts, drainpipes and downpipes, sewer pipes, chimneys and more. This semi-flexible / semi-rigid waterproof inspection camera is ideal for a variety of industrial and trade applications. Images and videos can be stored directly on the device or on the included SD memory card. PCE-VE 1000 is an industrial endoscope, borescope, videoscope or inspection camera display featuring an exceptionally large 7" high-resolution LCD screen for impressive on-screen viewing capabilities. PCE-VE 370HR is a four-way articulating inspection camera, industrial endoscope, borescope or videoscope for the non-destructive inspection (NDI) of hard-to-reach places. The waterproof camera head features 6 LED lights (4 front, 2 side) for optimal illumination. In addition, digital image magnification or zoom of up to 2 times is available, plus boost functionality for improved image quality in the dark. The inspection camera PCE-VE 300-H is the optimum for experts and development engineers. Choose between many different cables for the inspection camera. This inspection camera not only gives you an optical insight into the inner workings of machines and systems without first disassembling them, it also allows images and video sequences of the components to be inspected to be stored directly in the device. 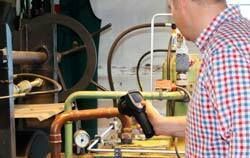 The optimal tool for inspection of industrial machinery and equipment. The PCE-VE 200SV1 inspection camera is a nondestructive inspection camera. Thus, the PCE-VE 200SV1 inspection camera is the ideal instrument for diagnosing hard-to-reach areas. Thus, the areas of mechanical engineering, sanitary and heating construction, and the entire construction and construction industry are among the main applications of the inspection camera PCE-VE 200SV1. The Inspection Camera PCE-VE 250 is a diagnostic tool with integrated cleaning function. This makes the Inspection Camera PCE-VE 250 ideal for use on machine components. The cleaning can be done either with compressed air or compressed air in conjunction with water and or detergents. The inspection camera PCE-VE 200SV3 is a nondestructive inspection camera. Thus, the inspection camera PCE-VE 200SV3 is the ideal instrument for diagnosis in hard-to-reach places. For example, the areas of mechanical engineering, sanitary and heating engineering, and the entire construction and construction industry are among the main areas of application of the inspection camera PCE-VE 200SV3. PCE-VE 320N is an inspection camera, endoscope or borescope for the non-destructive inspection (NDI) of engines, machines and more. This industrial borescope is an ideal tool for diagnosing issues in hard-to-reach places. The waterproof camera head features 4 LED lights with automatic illumination. In addition, digital image magnification or zoom of up to 2 times is available. Rigid Inspection Camera for visual inspection in small and narrow holes and cavities. 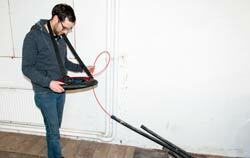 With a diameter of 4 mm and a length of 175 or 432 mm / 6.9 or 17 in this rigid Inspection Camera is very versatile. The integrated LED lamp allows for a very good illumination of cavities to be inspected. PCE-VE 330N is an inspection camera, borescope or industrial endoscope for the non-destructive inspection (NDI) of engines, machines and more. This industrial borescope is an ideal tool for diagnosing issues in hard-to-reach places. The waterproof camera head features 4 LED lights with automatic illumination. In addition, digital image magnification or zoom of up to 2 times is available. PCE-VE 320HR is an inspection camera or borescope for the non-destructive inspection (NDI) of engines, machines and more. This industrial borescope is an ideal tool for diagnosing issues in hard-to-reach places. The waterproof camera head features 6 LED lights (4 front, 2 side) for better illumination. In addition, digital image magnification or zoom of up to 2 times is available, plus boost function for improved image quality in the dark. Rigid Inspection Camera for visual inspection in small and narrow holes and cavities. With a diameter of 2.7 mm / 0.11 in and a length of 175 mm / 6.9 in this rigid Inspection Camera is very versatile. The integrated LED lamp allows for a very good illumination of cavities to be inspected. PCE-VE 333HR is an inspection camera, borescope or endoscope for the non-destructive inspection (NDI) of engines, machines and more. This industrial borescope is an ideal tool for diagnosing issues in hard-to-reach places. The waterproof camera head features 6 LED lights (4 front, 2 side) for better illumination when using the mirrors. In addition, digital image magnification or zoom of up to 2 times is available, plus boost function for improved image quality in the dark. Call PCE Instruments' technical support hotline for assistance with finding the right inspection camera to meet your needs. Our technical support specialists will ask you specific questions about your application or your project, and then recommend a suitable inspection camera product for your inspection task. Below you also will find some tips that you should take into consideration when selecting or buying an inspection camera. One of the key points to consider when choosing an inspection camera / industrial borescope camera is the cable. Imspection camera cables are available in many different lengths and diameters. Think about the cable diameter and length requirements needed for your application. In most instances, the diameter is determined by the existing openings of machine components, pipes, vents, etc. With the cable length, it is important not to choose a cable that is too short. If your diameter and length needs vary depending on your application, you may want to purchase an inspection camera that accommodates multiple cable diameters and lengths. The advantages of such an inspection camera are the onetime purchase price and low follow-up costs for retrofitting, such as purchasing cables with smaller diameters or longer lengths. PCE Instruments offers rigid and flexible inspection camera cables. Among flexible cables, you can find 2- and 4-way articulating systems. This articulation allows the inspection camera head to be moved in different directions and angles up to 360 °. In flexible inspection camera cables, images are transferred to the handheld device via a glass fiber bundle or, as it is in the newer digital borescopes, via the camera in the cable. Flexible inspection camera cables are available in many different diameters and lengths, allowing for a variety of practical usages. In addition, most digital inspection cameras with flexible cables have memories for storing photos and videos. Rigid inspection camera cables typically offer very small diameters to allow the inspection of very components and spaces. Industrial borescopes with rigid cables are usually analog, meaning they don't afford users the opportunity to record and process images and videos without the use of a special adapter (sold separately). In many cases, it is necessary to record and store images or video sequences of a visual inspection. Before buying an inspection camera, consider whether or not you require this functionality. Nowadays, many digital borescopes feature a removable SD card memory. A removable SD card makes it easy to download photos and videos to a PC or laptop. With some of the inspection camera models, additional analytical software can be purchased. This software provides measurement capabilities for documenting the progress of cracks or fractures. The documentation can be saved or sent via email. PCE Instruments differs from other online shops by providing real customer service and support. We try to find the best inspection camera for our customers and maintain mutually beneficial and long-lasting business relationships. Give us a call at +44 (0) 2380 987 035 for PCE Instruments UK or +1 (561) 320-9162 for PCE Americas Inc. to experience our customer service and technical support firsthand. First of all, before purchasing an infrared camera, it is necessary to clarify for which application the measuring device is to be used. Infrared cameras with a lower resolution should not be used for precise temperature measurement. Infrared cameras with a VGA resolution could be used for easy temperature control, but practically, this does not make sense, since the devices of this kind has not been designed for such application. Low resolution, for example, 38 x 38 pixels: An inspection camera with a very low resolution as the PCE-TC 28 is used for simple temperature tests. The cameras almost replace a pyrometer. They are a better infrared thermometer with the advantages of a real thermal imaging camera. The measuring instruments can be perfectly applied to test the temperatures of fuses and electrical assemblies in control cabinets. Or also for simple and point temperature measurements. Furthermore, an inspection camera can also be used for the rapid control of water pipes, pumps, bearings and gearboxes. Many of these infrared cameras have a SD card memory, so images and videos can be stored for documentation purposes. 160 x 120 pixels medium resolution: An inspection camera with a resolution of 160x120 pixels can be used for more demanding measuring tasks. With this thermal imaging inspection camera the thermal bridges on buildings can be searched and found, or the component temperature can be measured in the electronics development. An infrared inspection camera with a high resolution: For an inspection camera of this class the thermal resolutions starts from 640 x 480 pixels, what corresponds to the default VGA-resolution. This inspection camera also has documentation possibilities. Due to the high pixel density, much better thermal images can be recorded. Thus, a much better picture quality is achieved. Should the infrared camera be mobile or used stationary? This question is fundamental and irreplaceable for the choice of the inspection camera. For sure, it is possible to use an inspection camera, which is designed for stationary installation, in which the thermal imaging inspection camera is connected to a laptop via USB, also as a mobile device. The other way round, it is much more complicated to use a mobile IR inspection camera for a stationary application. Not the least important reason for this is the design and construction of the inspectioncamera. Infrared inspection cameras for stationary applications such as those of the PCE-PI series have small dimensions and no own display. As a result, these infrared cameras can be easily mounted on machines and in places which are difficult to access. Furthermore, this inspection camera has the possibility to be controlled via USB or network. Thus, a continuous monitoring of a process is possible without any problems. 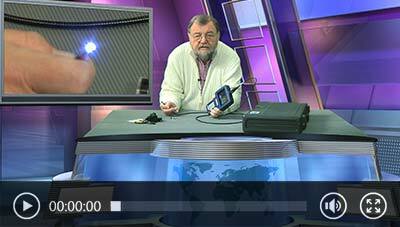 A handheld inspection camera cannot be used for online thermography just like that. Frequently, the software of mobile cameras offers a perfect documentation possibility, but cannot be used for online measurements because the image is not transmitted live. You need to clearly understand this, before purchasing your inspection camera and select the infrared device carefully. Our consultants are ready, even on telephone, to assist you in making a decision when selecting the inspection camera. They help you when it goes about specific questions about a infrared inspection camera and whether certain functions are available. An inspection camera is an optical device consisting of a tube (rigid or flexible) with an eyepiece on one end and the lens on the other end, connected by the optical system. An inspection camera has a very high image quality and is affordable at a good price. It consists of the visual and lighting systems. The visual system is usually a gradient, rod or lens optics, which is enclosed in the inner metal tube. The lighting system consists of an optical fiber for illuminating the inside of the area. The optical fiber is located between outer and inner metal tubes. The image of the illuminated object is transmitted through the optical system so the viewer’s eye could see it. An inspection camera can be equipped with a video camera to transmit the images on a display or computer. They are characterized by four main parameters: the diameter of the operating part, the length of the operating part, the angle of the observation direction and the angle of view. You should take into consideration that increasing of the field of view leads to reducing detalization. It means that you can see a lot but in small sizes or a little but in big sizes and in detail. The main advantage of inspection cameras is a high resolution of up to 25 lines per millimeter. The inspection camera is designed to control the work where the inspection area is not easy to reach. They are usually used for visual inspection of aircraft engines, industrial gas turbines, steam turbines, internal combustion engines and the engines of cars and trucks during maintenance and performance evaluation. An inspection camera is common in forensic examinations in law enforcement, in the building inspection to check the ceilings and walls of the buildings, in the weapon industry for the inspection of the fire weapon barrel and so on. Inspection cameras can be flexible, rigid or video borescopes. A flexible inspection camera is used to inspect bended tubes and cavities. They transmit images of areas inaccessible to the naked eye. The main features of these devices are convenience, focus, the eyepiece, a bright illumination, which allows you to clearly view dark places. Video borescope differs from the previous type of inspection cameras by having a miniature camera at the end of the flexible tube. They also have an illumination for capturing images or videos in dark places. Camera and flexible tube in many models can be immersed in the water. Their main features are high quality, clear digital images and videos. With the help of this instrument you can get and save images and videos for further transmission in a computer. A rigid borescope is used to inspect areas or cavities in a straight line. That is why their usage is limited. There are certain objects and places where it is better to use rigid borescopes, for example, cylinders, fuel injectors and so on. They are affordable at a lower cost and provide high quality images. The status check with the help of an inspection camera can significantly save maintenance costs. In many cases it allows to understand whether it is necessary to disassemble the turbine for further diagnostics. While choosing the inspection camera you have to take into consideration a type and size of the inspected object, the distance of the object from the access point, access point diameter and image clarity. A PCE inspection camera is exceptionally durable, reliable and easy to use. They have water and dust protection along with producing maximum illumination and resolution. The device can be operated with one hand. Buttons are ergonomically designed to offer one-handed easy control to view targets from the ideal angle. On an inspection camera, the inspection cameras have a cylindrical form that contains a light and a lens that are inserted into cavities with limited accessibility. Magnifying the image from the optic fibers allows visualization of the area being analyzed to determine the fault. Traditionally an inspection camera is used for diagnostics in the medical sector. Nowadays, an industrial borescope camera is used in the industrial sector, for cavities with limited accessibility, pipe welding inspection, injection molding, machinery, motors, and casting, etc. It is the perfect assistant for those diagnostics that have to be done where a technician has to work in areas that are difficult to reach or it is impossible to see an area using normal methods. Our inspection camera has a flexible cable and the cable of this borescope camera returns to its original form after the cable of the inspection camera is extracted. For documentation, we offer more than one video borescope with camera and video adaptor. A wide range of videoscopes, fiberscopes and our line of industrial borescope camera, with different diameters and magnifications are listed above. The various scopes that we quote at PCE-Instruments makes us one of the top dealers in the World for the inspection camera. Our industrial borescope camera is battery powered and has a small diameter that gives you great flexibility while performing inspections. You can also connect a 90° mirror on an inspection camera tip; so that you get a lateral view. Almost every inspection camera has a memory and the data can be stored on a SD card, so that the data can be used as attachments to emails or reports. Nearly every inspection camera has a build in LED light what allows you to see in dark areas, so that nothing will go undetected. Infrared measurement consists of capturing an image to make visible the heat radiation from an object, invisible to the human eye. This inspection camera doesn't require contact with the device and the camera can record events such as explosions, fires and the course of movements. Infrared measurements can be recorded to produce a scheme of temperature measurements of an area. Infrared images illustrate the heat emitted by objects, machines, buildings, etc. 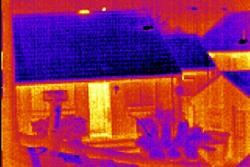 Thanks to a thermal inspection camera you can have an idea about the loss of infrared heat or determine heat sources. To guarantee quality, thermal imaging is becoming more frequent as in installing insulation during the construction of a building. This allows to locate problems without causing damage to the building. Our thermal cameras are suitable for these situations. Thermal inspection cameras provide us with a thermogram, a representation in color of radiation differences in objects. Since infrared radiation is a parameter related to temperature, a thermal inspection is used to discover differences in materials temperature. This allows for the thermal inspection camera to be used in diverse fields, for instance in a building, because both heat loss and isolation are key elements for a building efficiency and comfort. This type of thermal inspection cameras may be of interest to builders, architects, consultants, promoters, management. With a thermal inspection camera you can check heat loss in houses caused by air infiltrations through junctions between roofs and walls. Thermal inspection cameras can be also used to detect humidity and damages caused by water, such air humidity on a roof caused by a leak. Thermal properties of water enables to detect humidity by a thermal inspection camera under certain conditions. Thermal imaging cameras can be used in various fields (checking roofing and coating status, calculation of thermal transmission in surfaces, inspection of dry processes in materials, heating and cooling systems operation, domestic electrical risk assessment) and in applications where the differences of temperature provide important information. When winter arrives, it increases the transmission of influenza in some places with a lot of people such as airports, transit stations, supermarkets, etc. One of the most characteristic symptoms of influenza is high fever. In some U.S. airports, thermal inspection camera are used to check passengers to discover if they suffer any symptom of the virus H1N1 as well as other diseases. These thermal inspection cameras can detect fever without any contact. A thermal inspection camera is like a normal camera but it can register light reflected by an object. Thermal inspection cameras are heat sensitive devices which show images depending on their temperature, so thermal imaging cameras are especially useful in dark environments. Thermal inspection cameras display objects depending on their temperature, hotter objects are brighter. A thermal inspection camera uses very sensitive systems which can measure temperatures up to a fraction of a degree. Thermal inspection cameras were firstly used during the Severe Acute Respiratory Syndrome (SARS) in 2002 and 2003 in the airports of Singapore and China. Since then, thermal imaging cameras have been continuously used. Although a thermal inspection camera can detect high body temperature, it cannot detect human swine influenza. Any traveler exposed to any effort (running, carrying excessive weight, drinking alcoholic drinks together with an excessive heat) may present an increase in body temperature. Thermal inspection cameras PCE-TC series have a software which allows for the detection of any heat source. With the help of a temperature calibrator and programming it at 38ºC for example, you could check if the thermal inspection camera detects temperature accurately. The software of the thermal inspection cameras emits a visible alarm to the PC when the thermal inspection camera detects a higher level of temperature. This way, a high accuracy is assured. These thermal imaging cameras combine visible and thermal images to create a person’s “heat picture”. With this image you can see a display at the rear of the camera as in the standard digital cameras. A cursor automatically points the hottest area of the image, normally the person’s face. It is better to check people one by one. Thermal imaging cameras were originally used within the military sector. When the technology of thermal imaging cameras advanced, they started to be used in more fields of application military use, predictive maintenance, control of processes, detection and analysis of fire, inspection of floors, insulation, walls, etc as well as in medicine. Most damages in the industrial sector both electrical or mechanical can be previously detected by changes of temperature by thermal inspection cameras (fixed cameras for continuous control or handheld cameras for spot checks). The use of the thermal inspection camera in the maintenance of installations, machines, etc makes it possible to detect future damages and avoid their consequences. At purchasing a camera, the customer should take into account: number of pixels, spectral sensitivity, sensor life, field of view, dynamic range, input power, mass and volume.